Enjoy the beautiful landscapes of Snowdoniawith a gentle or more challenging walk in the mountains. We offer a variety of mountain walks for groups of all ages and abilities. Choose one or all of the 14 3000ft peaks or a gentler valley walk. No previous experience required - enthusiasm is the key! Mountain Walks/Scrambles happen in almost all weather conditions. Snowdon/Yr Wyddfa - the biggest. Lliwedd - training venue for early Everest expeditions. Moel Siabod - a varied journey from valley to summit. Tryfan - it looks impenetrable a great rocky ramble. Y Garn - a grand armchair shaped mountain. Glyder Fawr - enjoy the rocky way up, recently remeasured to 1000m! Glyder Fach - sit on the famous cantilever stone. 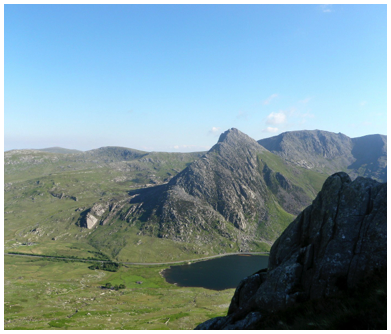 Pen yr Ole Wen & Carnedd Daffydd - two fantastic peaks. Cnicht - the ‘Matterhorn’ of Wales.